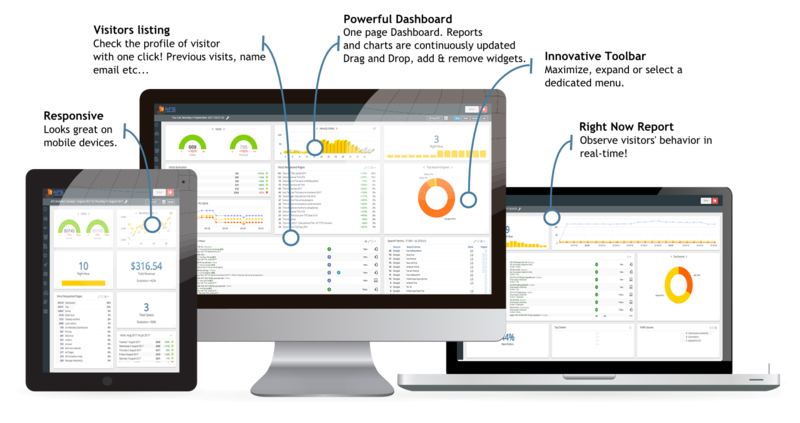 Monitor your Website Traffic in real-time with AFS Analytics! All-in-one: metrics, user behavior analysis, and SEO tool. AFS Analytics provides advanced web analytics solution in real-time using the latest technologies. Get priceless information about your website audience and learn how to improve its efficiency. Analyze your visitors behavior and understand how they interact on your website. AFS Analytics offers you two real-time reports, the main dashboard displays all metrics on a single page, the “Right now” allows you to monitor the current users activity on your website. AFS Analytics can be used as an alternative to Google Analytics or in addition to get advanced features. We simply need general information about the website you want to analyse. You'll get a tracking code to insert into your website pages. 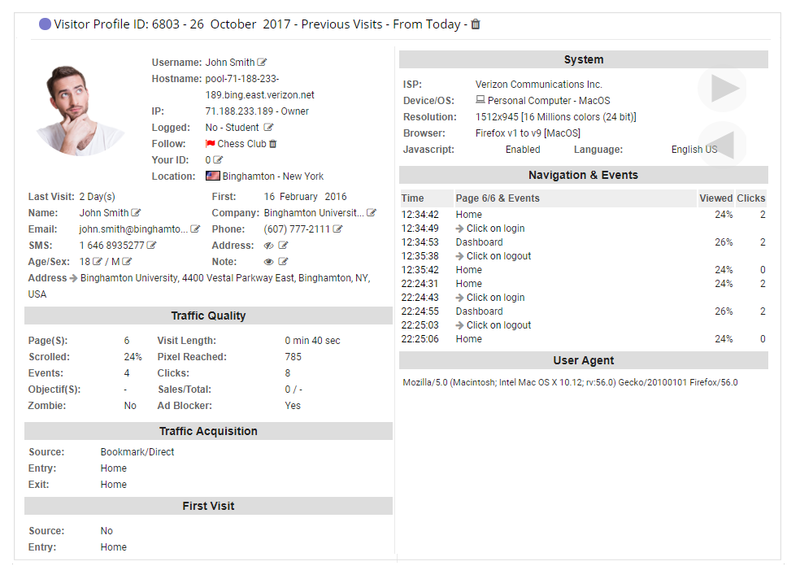 So AFS knows when your site is recording visits. 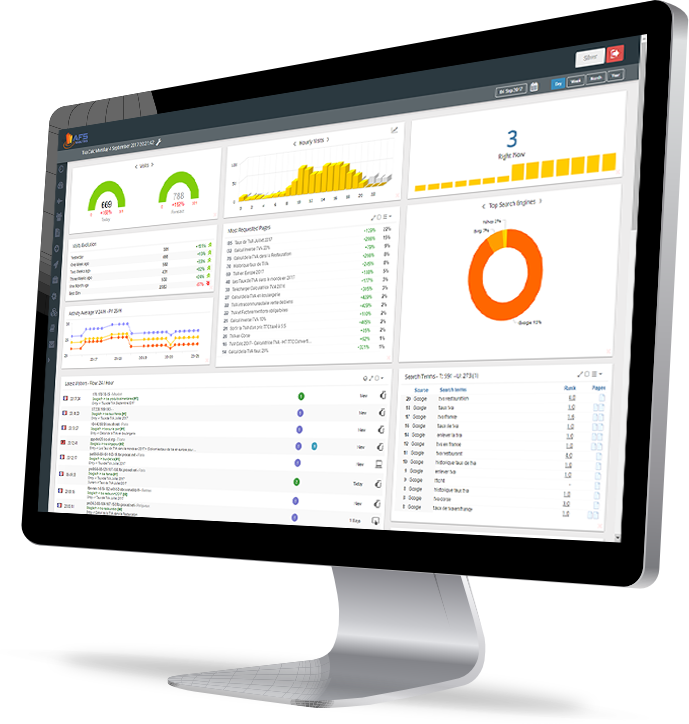 AFS Analytics™, your advanced all-in-one web analytics solution. Video demonstration of the capabilities and usage of your web analytics solution. Your Own Custom Analytics Dashboard. Select and drag and drop widgets into your preferred order. 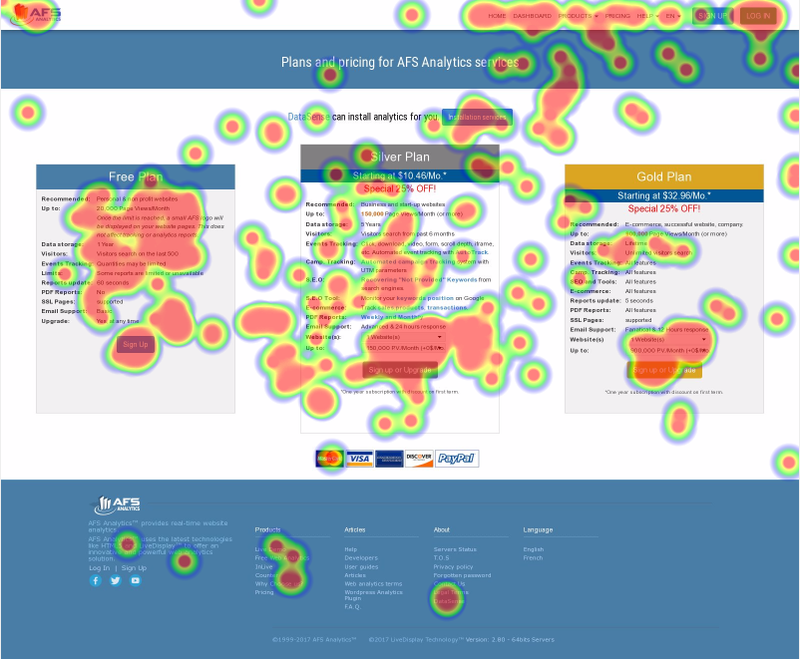 Heatmaps, Understand what users want and how they interact on your website. Visualize the most popular areas of your pages. Access to detailed user profile. Get a complete list of your visitors and access their detailed profiles. Recovering "Not Provided" search engines keywords used by your visitors. With its algorithm using artificial intelligence, AFS Analytics recovers the search terms used by your users. A question? Partnership? A quote? Use the form below to submit your message to our team..